In recognition of Crime Prevention Week we will be running different crime prevention articles each day so be sure to check back. To start off the week, we would like to remind you of the advantages of marking your valuables with the Trace Pen. 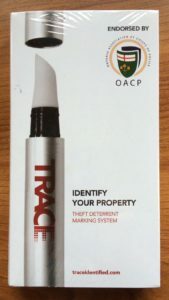 Trace Pens are available from Grande Prairie District Rural Crime Watch Association directors for just $35.00 or $32.00 if you buy 10 or more. Trace Pens are a great way to not only mark your valuables but a way to ensure the thief is convicted when caught with what can then be proven to be someone else’s property. Trace Pens are capable of marking approximately 25-30 items, depending on how large of a microdot you make and how many markings you intend to put on the item. Be sure to buy enough to mark all of your valuables from cameras to fuel tanks. Great for marking farm related equipment, oilfield equipment, batteries, pipe and the possibilities are endless! Crime prevention is multi-faceted and can encompass a variety of stakeholders and concepts. In its most basic form, however crime prevention starts with each individual resident, and thus anyone can take an active role in promoting safe communities. Property crime in particular is often a contentious issue as the individual often feels powerless to address it. The following will serve as a gentle reminder of what we can all do in contributing to property crime prevention. Property crime is often related to premises, or vehicles, left unattended and unsecured. In most cases these incidents could have been avoided. For the majority of residents a feeling of security is found in the safety of their homes and the following tips are useful for protecting various different property. Conduct a security check of your home to determine possible entry points and any weaknesses it may have. Keep all entrances and any out-buildings well-lit and clear of concealing greenery. Do not leave telltale signs that you are away for any extended period of time. Install good locks and use them, even if you are home. Keep windows and doors (including garage doors) locked and properly secured. Keep valuables and money out of sight and secured. This includes properly storing keys to other properties or vehicles. Vehicles include all modes of transportation such as automobiles, commercial vehicles, bicycles, recreational vehicles and trailers. Lock and properly secure any vehicle and store the keys in a safe place away from the vehicle. Never leave valuables in your vehicle, especially not in plain-sight. Consider investing in a theft-deterrent system and remember to use it. Keep your registration and insurance papers secure. Never leave your vehicle running with the keys in the ignition and unattended. Mark items of valuable for identification and ensure to accurately record and store identification/serial numbers. This would apply to any number of items including recreational vehicles, bicycles, and electronics, among others. Every effort made by individual residents to reasonably protect their property is a step in the right direction. Personal and public safety is everyone’s responsibility – play an active role in crime prevention! Neighborhood Watch programs are used to deter crime, common concerns being theft and vandalism. Have you ever wondered if other countries had Neighborhood Watch organisations too? Here are some snapshots showing what Neighborhood Watch programs look like in some countries around the world! Sweden’s Neighbourhood watch program has been in place for over 40 years. In Japan, prior to 1947, there was the tonarigumi was used for the maintenance of public security. A network of informants was established linking every neighborhood association with the Police to watch for possible infractions of national laws, and suspect political or immoral behavior. The group is now called chonaikai, or jichikai. These associations help residents to connect and work together – through various activities and voluntary services – for the common good of the community. Groups of committee members and residents take turns to patrol their neighbourhood. There is also a fire patrol which reminds residents to take precautions against fire. Armed with flashlights, each group patrols an assigned area. Residents participating in a fire prevention drill organised by the neighbourhood association. In recent years, the Dutch have started running their neighbourhood watch programs heavily relying on ‘Whats App’ groups. The program is organised by members of the community, and police are included in the groups. The program has proven to be very successful. Using the app has reduced burglary by about 50%! In Ireland, there are two programs with different focus; Neighbourhood Watch and Community Alert. Neighbourhood Watch is a crime prevention and community safety programme for urban areas. It operates as a partnership between An Garda Síochána (this the Irish word for the police organisation in Ireland) and the public. It works on the basis that every member of a community can help to improve the quality of life in the area by keeping a look out for neighbours and reporting suspicious activities to the Gardaí. Community Alert is a community safety programme for rural areas with an emphasis on older and vulnerable people. It operates as a partnership between the community, An Garda Síochána and Muintir na Tíre (this is national organisation promoting (rural) community development in Ireland, established in the 1930s). The Community Alert program works on the principle of shared responsibility for crime prevention and reduction. So as you can see, different parts of the world have different structures and implementation. Neighbourhood watch programs are an important part of a safe and connected community.